SV650 stock shock bolts right in. 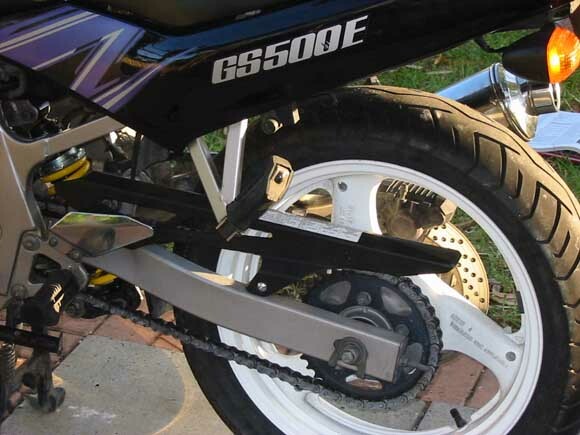 The SV650 rear shock bolts right in and is a great way to replace your worn stock GS shock. Whether this shock is a better performer than the GS shock is debatable (no one really knows for sure) but it can be an excellent way to replace your stock shock if it's knackered, as many are, considering their age. That is one of the benefits of using the SV shock-availability. Also looks great with it's yellow coils. 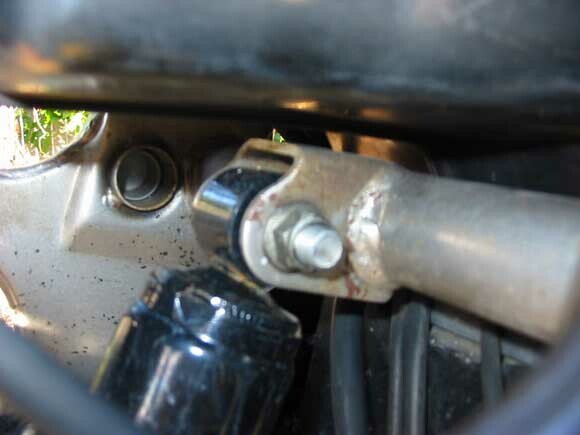 Installing this shock will raise bike ~2" but there is enough room on the bottom clevis that you can cut some off and redrill the bolt hole to make it same length as stock GS shock. Alternatively, you could cut down and reweld the dogbones to lower height back to stock but careful as this changes the geometry in unknown ways. Make sure to readjust you chain tension after doing this. The SV shock only has adjustments for preload jsut like GS-a disadvantage for a replacement shock but still worth considering as a direct replacement, in my opinion. Lee McDonald says: The standard SV shock is a bolt in afair. As you can see top bolts straight in no mods and there is no clearance issues at all. Picture of bottom shows how I have cut down the tabs on the SV shock and redrilled the holes. The SV's tabs are about an inch longer. The width and everything else is spot on so other than that it was a bolt on affair. Here is where it gets easier. There is no need to modify this. I did this in order to try and get the shock length as close to the GS as possible but in the end it didnt work. If anyone does the conversion just leave the stock SV shock as is and bolt it straight in. This does however raise the rear end by about 2 inches. All that is required is the dogbones need to be lengthened. I found that to lower it by two inches the dogbones need to be extended by about 10mm. If you measure hight from one point to the ground and then once the shock is on take the bolt from the bottom of the dog bones and let it hang. Then get someone to help lower the bike to the original measurement done before with the standard shock and you can see how much the dogbone will need to be lengthened to get it to fit back on. Any metal fabricator could make new dogbones for next to nothing but if you are good with a welder you can do like I did and cut the dogbone in half and then weld some thick flatbar to both sides and done. So in short. The only mod required is to lenghten the dog bone by around 10-15mm. Thats it, everything else is a straight bolt on affair. Why did I bother with an SV shock? I did this shock change because of a few reasons. My stock GS shock was completely stuffed, wasted. It was bottoming out everywhere and you could hear the gas getting sucked in and pushed out when riding. The SV shock was sitting in my garage. So it was free. I saw a post saying it couldn't be done but I thought I would have a quick look with the tape measure. I didnt want to spend big dollars on ride improvement I just wanted the rear end to work like it should. It was getting dangerous. It is a bolt on affair but as stated I did the dogbone extension to lower it back to stock height because on weekend rides it is what my girlfriend uses. She is only 5ft 3 inches and had a hard enough time touching the ground even without it being raised. Sure I would not recommend cutting and welding the dogbones to any normal person. I however have years of welding experience rebuilding cars and braced these suckers so they would be stronger than originals. I also did mention that new ones could be made easy enough from any metal fabricator. I agree the GSXR one probably is better and does have more adjustment. They are simply not available here in Aus (neither is the Katana). We only get the GSXR 750 and they are very rare. 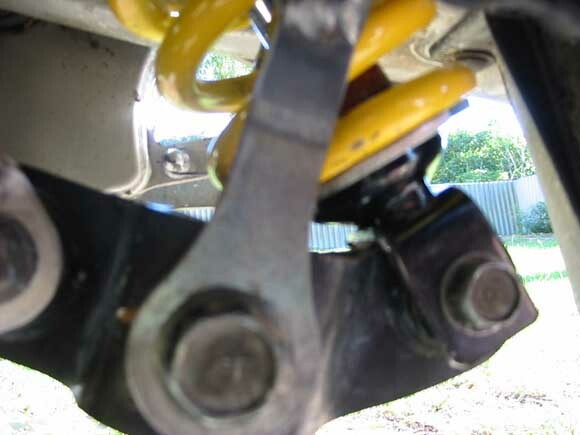 This just gives people another cheap alternative if they are stuck and need a new shock. Special thanks to Lee McDonald form Australia for submitting this.